Earlier this week, Isis Mobile Wallet payment platform went live on three U.S. carriers - Verizon, T-Mobile, and AT&T. Verizon had only one device listed as supported at launch, with the DROID RAZR HD / MAXX HD compatibility set to arrive by the end of October. The Galaxy S III was also listed, but according to this list, it doesn't seem to be ready just yet. 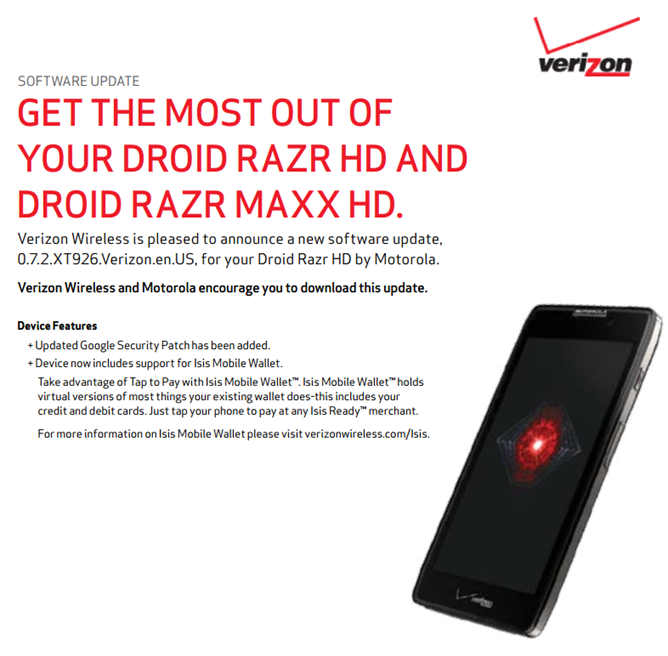 Two days ago, Verizon released the first update v0.7.2 for the RAZR HD variants with only a mention of one new feature in the changelog: an "updated Google Security Patch." Today, Verizon amended the update document and added the mention of Isis Mobile Wallet, thus fulfilling its promise right on schedule. Since the version number didn't change, I'm going to assume that they just forgot to include the right information the first time and there is no separate second update. Of course, unless you live in Salt Lake City or Austin, you probably won't even care. If you do, however, go give Isis a try at one of almost 1000 local businesses, such as 7-Eleven, Home Depot, Rite Aid, and Jack In The Box. [Weekend Poll] Do You Prefer The Classic 10" Tablet Layout, Or The New Hybrid UI?